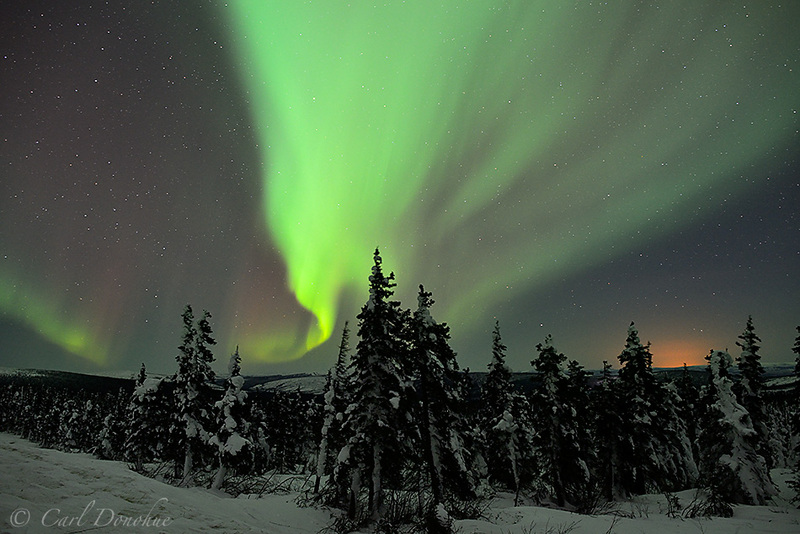 The northern lights over the boreal forest of sub-arctic Alaska. Just returning home from some real March Madness. Alaska March Madness. I left home around the 20th of February, and other than one night between trips, have been gone since then. Good times. Photographing some awesome arctic winter landscapes, great northern lights and aurora borealis photos and a fantastic week based out of a cabin, skiing and snow shoeing in Wrangell – St. Elias National Park is what i call March Madness. Can’t wait til the next one! Seems like you guys have had an amazing aurora year. This is sweet! I need a KP of around 7 to see it near me, and it has come close many times already – all with nights filled with cloud cover. Posted on Monday, April 1st, 2013. This epic photo was taken by Carl Donohue.